Mix butter, 1 cup sugar, orange rind, and eggs thoroughly. Stir in sifted flour until fully incorporated. Chill dough. Heat oven to 400°F. Break off small pieces of dough and roll into circles, a little smaller than a ping pong ball. With a finger, press an indent into each cookie and press a piece of candied cherry in the indent. 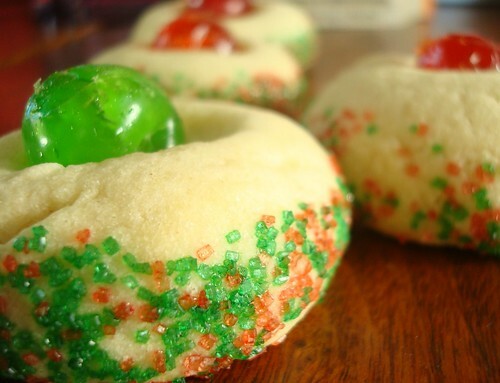 If desired, roll the sides of the cookie in red and green sprinkles for a pretty effect. Bake for 12 minutes, or until set but not brown.